A rug’s pile refers to the density of the fibers. Pile can be cut or left in loops. Pile can be short and flat, or shaggy and long. Rug pile also goes hand in hand with rug height, which is the thickness of the rug or carpet. Height is measured from the surface of a rug down to its backing. There are five things to use to determine the ideal rug pile for you. Pile heights are characterized by how tall the fibers are. It’s automatic to assume thicker is better, but it isn’t always so. Some very fine rugs are thin. Rugs are made with different things in mind. 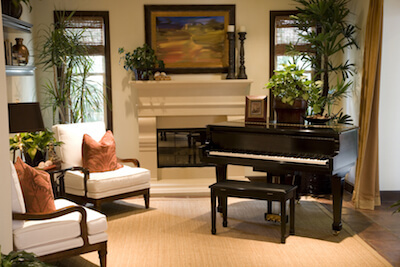 Consider a rug or carpet’s final resting spot before you select the choice for you. High traffic areas will benefit from rug density to stand up to daily abuse. As a general rule, shorter pile rugs will last a bit longer than their longer pile counterparts. They are also easier to care for and can be easier to maintain with regular vacuuming and spot cleaning. Carefully consider the furniture in your room before making a final selection. Longer piles can feel more soft and luxurious, but they are also more susceptible to crushing underneath heavy items. The more space your furniture takes up, the more chance of marking your rugs forever. Longer piles require extra care when cleaning. Ensure your vacuum has a high pile setting so as not to get fibers caught in the rotating beater bar. If not cleaned properly, longer piles can quickly crush and wear out.